The following photo was sent in by Elizabeth. Do you think it's a Banshee? 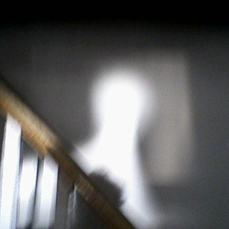 This is a photo snapped of what I believe to be a Banshee? It was taken, via cell-phone camera approximately 1 week before my step-father’s cousin died. His mother was on her way up to his room to check on him, as she turned the corner, only to see this! Having her cell-phone in hand she quickly snapped the shot, interestingly enough the cell-phone would no longer work after taken the photo, she could not shut it off or move the pic in any way? I recently decided to do some research on the subject and came upon your web-site, any feedback you can provide would be interesting to our family. Watch a sneak peek of the next all-new episode of Ghost Hunters, Wednesday at 9/8c. Watch a sneak peek of the next all-new episode of Paranormal Witness, Wednesday at 10/9c. Tonight is the premiere of Ghost Hunters 2nd half of Season 8. Their first investigation without co-founder Grant Wilson will take place in the Old Charleston Jail located in Charleston, South Carolina.